(Submission inside) Plans for the proposed underground railway from north west to south east of the city are not yet finalised. On Friday the 13th the Minister of Planning said the location of the proposed Domain station may be moved and yet the Age announces 14th Jan that work would begin on Monday the 16th. This is clearly vandalism. They are going to start destroying trees and moving gas and sewer lines at the Domain. Remember that St Kilda Road is heritage listed and Heritage Victoria have received thousands of objections and Heritage Vic have not yet made a determination. One has to wonder how much pressure they are under by this State Government in their determination to start digging. We are sick to death of hearing them say they are ‘shovel-ready’. How dare the government say that the damage to St Kilda road will be worth it for the advantage the rail will give. The necessity for this rail is being questioned by respected planners in Melbourne. There are far more important road and rail projects that are needed first. This in relation to the damage by the proposed Metro Underground Railway to the wonderful Boulevard known as St Kilda Road. I write to object to the granting of this permit. First point to be made is that the routing must be changed. More sensibly the route should be from the north of Melbourne via Southern Cross Station to Docklands and then to Fishermans Bend and from there across South Melbourne and crossing under St Kilda Road in the vicinity of Toorak Road and coming right through and linking to South Yarra Station. The proposed route does not make sense in that there would be a station at the north of the city and then at the southern end, really duplicating the existing city loop, totally unnecessary. On the other hand it makes much more logical sense to be on the west of the city and include Docklands and Fishermans Bend. However I really believe that this concept of an underground in that location, using that route, is not going to help Melbourne at all and it will be detrimental to the beauty and heritage of the city. This connection between north and south already exists using Southern Cross Station and Flinders St Station and connecting into the loop. There are far more important railway extensions that should be made first e.g. to the airport and to Doncaster. Why not require MMRA to submit costings and details of alternative routes for public consideration? It is hard to believe that they would even for one minute contemplate not tunnelling deep enough to avoid any damage on the surface that can be avoided in this significant heritage area. The idea of any cutting and filling rather than using deep tunnel mining throughout from the Arts Centre down Toorak Road and in South Yarra is absurd to the point of stupidity. Why is deep mining tunnelling not being used right through? It should be. It is thirty plus years since the City Loop was put in. That is deep and I think no cutting and filling was done. The idea of cutting and filling to save money is short sighted in the extreme. When Singapore want to do something new they send a team around the world to see where it is done best and get them to help. We believe our government needs to re-think this whole plan and route. They should immediately get in touch with authorities in London and ask their help and advice. They are the world’s best, having started their underground in 1863 and have an incredible underground network and only recently tunnelled out 42 kms from Heathrow airport to Canary Wharf and even further east without disrupting anything on top in such a devastating manner as this proposal from MMRA/Lovell Chen would. Or the government could ask Switzerland for help. They dig tunnels through miles of mountain. (See Switzerland, longest tunnel in the world: http://www.bbc.com/news/world-europe-36423250 “Gotthard tunnel: World’s longest and deepest rail tunnel opens in Switzerland”, 1 June 2016; http://www.houseofswitzerland.org/swissstories/environment/construction-world-s-longest-environmentally-friendly-tunnel, “The construction of the world’s longest environmentally friendly tunnel.” See: https://en.wikipedia.org/wiki/Channel_Tunnel ). But we talk of cutting and filling down one of the most beautiful boulevards in the world. Try doing this in Paris and you would be sent straight to the guillotine. 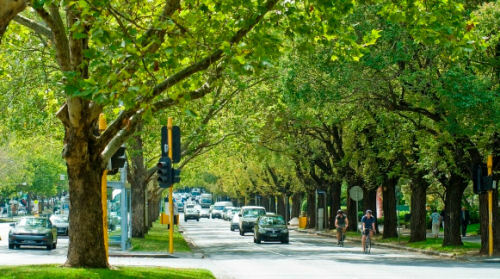 In contrast this proposal is for cutting and filling down one of the most beautiful boulevards in the world – and that is unacceptable loss and destruction of cultural heritage and the defining character, identity and beauty of Melbourne. St Kilda Road must not be damaged. It would a tragedy to have all the threatened trees knocked down. It would take many years for them to grow again to maturity. These are mature elms that have been there for probably 100 years. How dare they damage them in any way. The tunnels should be deep enough to prevent any damage or vibration to anything up on top whether buildings or trees as was done recently in London. (see: the Crossrail project, http://www.crossrail.co.uk/, “A world-class new railway for London and the south east,” with integrated transparent planning and design up-front and the project planned around heritage protection as a priority, including protection of the setting and visual amenity of protected heritage squares in London as a result of either the permanent or temporary works). We believe this application for a Permit should be refused. More time, planning and consideration for protecting and maintaining heritage and the defining landmarks, gardens and monuments of the city should be the starting and guiding principles around which transport and underground railway tunnels are planned. 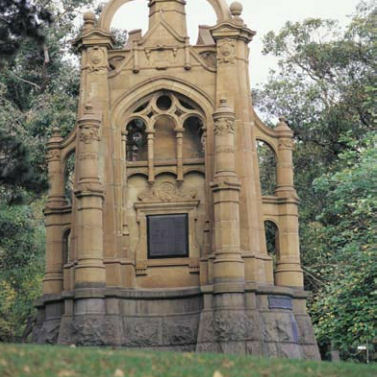 What is planned in the area of the Shrine is a total disgrace and a disregard of the importance and history and location of this beautiful Shrine in memory of the men and women who have lost their lives in wars defending Australia. 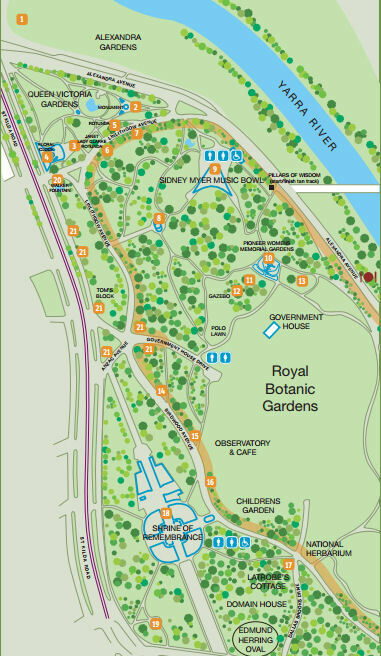 It was superbly planned and located in relation to St Kilda Road and the city and the surrounding gardens, and these visual lines and vistas are part of its heritage significance registration, and they should be maintained and left undisturbed. How dare any government propose to turn this into an excavation site wrecking the parks and gardens and trees surrounding it at least for years, possibly damaged forever. This must not be allowed. We, the people of Victoria, rely on you at Heritage Victoria to protect these heritage sites. This beautiful area of parks and gardens and trees must not be touched and damaged in the dreadful way proposed in this plan and application. In fact there is no need to have a train station in that position, at ‘Domain’, at all. Other locations and routes should be considered, costed and submitted, ones that are not on heritage sites, places and gardens and do not propose to do such dreadful damage to the whole precious heritage, gardens and monuments precinct. The current St Kilda Rd trams and tram stops and the current number 8 tram in its present route are sufficient. As said earlier the underground must be rerouted and avoid this whole area and come under St Kilda Road to link up with South Yarra Station. The plan and proposal is misconceived and would fail the people of the State of Victoria and cause loss of irreplaceable cultural heritage and civic identity and pride. There are alternative routes that are not on heritage lands and places and that is where MMRA should focus its planning and transport routes, tunnels and hubs. 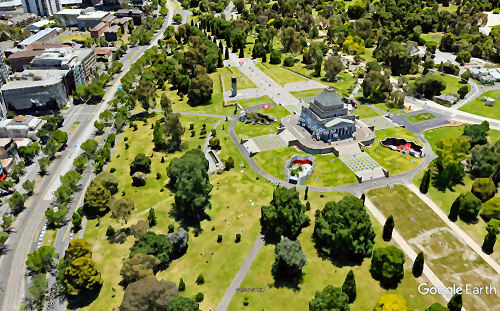 Whilst we support the development of transport infrastructure, this proposal, shockingly, is situated entirely in heritage sites and lands (St Kilda Road, the Shrine of Remembrance and Shrine reserve gardens and trees, the Domain Gardens, the South African Soldier’s Memorial, and adjacent affected trees, gardens and sites) and the costs of the proposal is heritage devastation, a far-too great a price to pay. It is an unnecessary and completely undesirable destruction of the entire area that is and should be heritage protected. Heritage Victoria should protect this heritage gardens and monuments precinct as a whole, and require MMRA consideration and costings for alternate routes that are not on and through heritage places be made available to the public. Is that protection not what Heritage Victoria and heritage registration is for?! The plans to dismantle and store this borders on an insult to the sacred nature of this cherished memorial. It must not be allowed to happen. Is nothing sacred? Like the Shrine, it is a sacred memorial to the fallen and must be totally protected. Do not allow this to happen to the South African soldiers’ memorial. This entire area is under Heritage Victoria protection and they would be derelict in their responsibilities if they approve such terrible destruction under their watch, even if they are at odds with the Government Department under which they operate. Their duty must be to protect these important heritage sites of State significance which this area most certainly is even if it means preventing the Government from following their plans. I and the coalition of 250+ resident groups (representing at least several thousand people of the State of Victoria; some groups have hundreds of members e.g. my local group has 600 members) strongly request this permit application be denied. The proposal is out of keeping with the values and heritage rights of the people of the State of Victoria. We ask that Heritage Victoria acts to stop this proposal and protects our heritage. We rely on you to act in accordance to protect this entirely-heritage registered area and to refuse this permit.